Welcome to the world of baking and decorating! 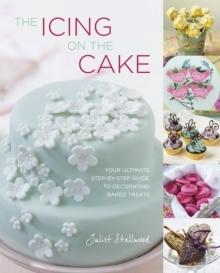 Whether you've never picked up a cookie cutter or a piping nozzle before or you're an experienced baker, this book will show you how easy it is to transform a humble cake, cupcake, biscuit, cake pop, macaron or other baked treat into a stunning creation. Juliet Stallwood runs a bakery specialising in decorated goodies and is renowned for her unique and imaginative designs. For the first time she is sharing her secrets in a book. In Chapter One of The Icing on the Cake, 'Decorate to Indulge', you'll find recipes for sweet comforts such as Chocolate Swirl Cupcakes and Raspberry Dust Macarons. Chapter Two, 'Decorate for Love', revels in the art of romance, including wonderful wedding favours like Kissing Birds Biscuits and a Heart Chocolate Box Cake for your Valentine. Chapter Three, 'Decorate to Celebrate', gives you recipes for birthday parties, baby showers and festive occasions, including teddy bear and rabbit cupcakes and a Gingerbread House. The book finishes with a flourish in Chapter Four, 'Decorate to Impress', which is full of extravagant show-off pieces like the Ivory Corsage Wedding Cake and Magnificent Mini Cakes. There are over 50 gorgeous recipes that are completely do-able, all with practical information and clear instructions. Plus, in Chapter Five you'll find all of Juliet's 'Best-Kept Secrets', from tools and equipment to techniques and downloadable templates, making this a must-have book.